Due to the thin atmosphere and extreme cold on Mars, sublimation is very significant in creating Water ice to water vapor. There is much evidence that the Red Planet once held much water. It probably had streams, rivers, lakes, and perhaps an ocean. Today, most of the water has left the planet, but a substantial amount is left frozen the ground and in a material called “latitude dependent mantle.” After cracks form in the frozen ground and mantle, the fun begins. The cracks greatly increase the surface area over which water can sublimate. Water sublimates and leaves behind dust. The dust insulates the ground below from losing more water for a time or, at times the dust can be blown away. This process creates various holes and pits on the surface. A common feature in ice-rich ground is “brain terrain.” So named for its resemblance to the human brain. Sublimation is greatly increased along the surface of cracks. In time, some broad ridges are left which may still contain some water-ice. The cracks form random patterns So the high and low points are random, thus looking like the outside of our brains. Initially the ridges are wide making what’s called “closed brain terrain;” later when ice leaves the core of the wide ridges, “open brain terrain” results. Brain Terrain to the right. Box shows the size of a football field. Picture taken with HiRISE, under HiWish program. Sometimes large amounts of ice leave along the cracks and the cracks are bigger, but less in number. Eventually, wide canyons appear. This forms what has been called “ribbed terrain.” A wide version of this sometimes forms wide canyons where the ground seems to be hollowed out. These places can be very beautiful. Ribbed terrain Sublimation along narrow cracks cause ribbed terrain with wide troughs to form. Hollowed terrain that developed from ribbed terrain. Sublimation along narrow cracks cause ribbed terrain with wide troughs to form. Hollowed terrain Box shows the size of a football field. Sublimation along narrow cracks cause ribbed terrain with wide troughs to form. Another form that develops in ice-rich ground, especially in the higher latitudes is what’s called “scalloped terrain.” It looks like material has been scooped out. Usually scalloped depressions have a steeper pole-facing wall and a gentle equator facing slope. Scalloped terrain The steep wall faces the north pole. Studies from orbit have shown the presence of ice in these formations. Close view of Scalloped terrain in the Casius quadrangle The steep wall faces the north pole. Studies from orbit have shown the presence of ice in these formations. During the Martian winter dry ice is deposited at the winter pole. During the Martian summer carbon dioxide ice sublimes from the summer pole. The amount that is deposited and then sublimated in the spring is huge—indeed at least 12-16 % of the atmosphere is deposited and removed each Martian year. This process causes great pressure changes and high winds. Spiders indicated with arrows. The plume on the right was caused by wind blowing from the bottom to the top of the image. In mid-latitudes, gullies are common in large areas in both the northern and southern hemisphere. They occur on steep slopes like crater walls. For many years, they were thought to be caused by running water. However, closer examination over a period of years, revealed that some are growing under present conditions where liquid water is not possible. Experiments on Earth demonstrated that chunks of dry ice moving down slopes could create gullies with a similar appearance. So, at least some of the gullies are being formed by dry ice building up in the winter and then causing erosion as they slide downhill in the warm spring. This process is aided by carbon dioxide vapor jetting off the dry ice and lifting it a bit. Note that present growth of gullies happens just as the temperature rises to where dry ice can easily sublimate. ↑ Mangold, N (2003). 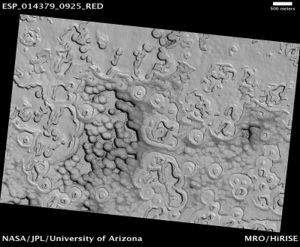 "Geomorphic analysis of lobate debris aprons on Mars at Mars Orbiter Camera scale: Evidence for ice sublimation initiated by fractures." J. Geophys. Res. 108: 8021. ↑ Baker, D., J. Head. 2015. Extensive Middle Amazonian mantling of debris aprons and plains in Deuteronilus Mensae, Mars: Implication for the record of mid-latitude glaciation. Icarus: 260, 269-288. ↑ Buhler, Peter, Andrew Ingersoll, Bethany Ehlmann, Caleb Fassett, James Head. 2017. How the martian residual south polar cap develops quasi-circular and heart-shaped pits, troughs, and moats. Icarus: 286, 69-9. ↑ Edgett, K.; et al. (2003). "Polar-and middle-latitude martian gullies: A view from MGS MOC after 2 Mars years in the mapping orbit" (PDF). Lunar Planet. Sci. 34. Abstract 1038. ↑ Diniega, S.; Byrne, S.; Bridges, N. T.; Dundas, C. M.; McEwen, A. S. (2010). 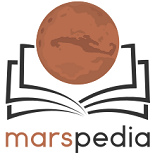 "Seasonality of present-day Martian dune-gully activity". Geology. 38: 1047–1050.